Big news folks! To kick-off a new cooking program, the Fullerton Arboretum has asked Jonathan Duffy Davis and Jonathan Dye to host the first cooking class of the 2015 season! We are happy to announce that on Thursday, February 26th at 6pm OurLocaltopia will be back in the Arboretum’s kitchen for a fun and educational demonstration style cooking class… And of course we want you to join us! Wednesday March 26th 2014 at the Yorba Linda Public Library! Don’t forget! 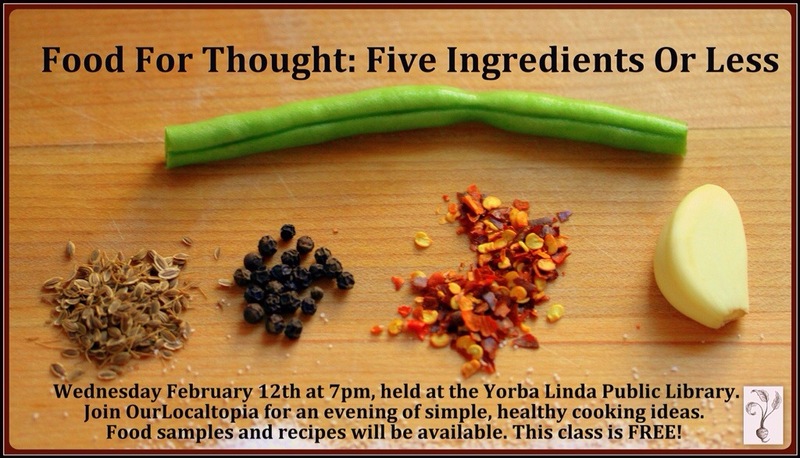 This Wednesday, OurLocaltopia is teaching another free cooking class at the Yorba Linda Public Library, as part of the “Food For Thought” series. This week’s class focuses on Garden to Table Cooking and will cover how to make the most out of your backyard edible garden or your weekly farmers market spoils. The Jonathans will provide up close demonstrations of at least four unique dishes, with samples and recipes available to the audience. Class will be held in the Library’s downstairs community room and will run from 7pm to about 8:30pm. Bring your friends, and enjoy a free night of delicious culinary education! See ya there! Hello folks! Join OurLocaltopia this Wednesday Feb. 12 at 7pm for another FREE cooking class held at the Yorba Linda Public Library! This week’s topic: dishes made with five ingredients or less! These simple, delicious recipes are great for first time cooks and seasoned chefs. Class will last about 60 to 90 minutes and is held in the downstairs community room. Park in the Library’s lower lot and look for the signs directing you to the class. Samples and recipes will be available to all who attend! See ya there!